I’ve been a customer of Personal Creations for quite some time now. I’ve ordered some very cute items from them over the years for my young nieces as well as my sons. I find their selection to be fantastic and I’ve always been impressed with the quality of the items that I’ve ordered in the past. When asked to do a holiday review for them I was excited for the opportunity. I like that Personal Creations have a lot of options for cute personalized gifts for boys. From Superhero pillow cases to sports-themed backpacks, they really have something for every little boy whatever his interests may be. When choosing a product for review I decided to look for something functional and fun for my youngest. 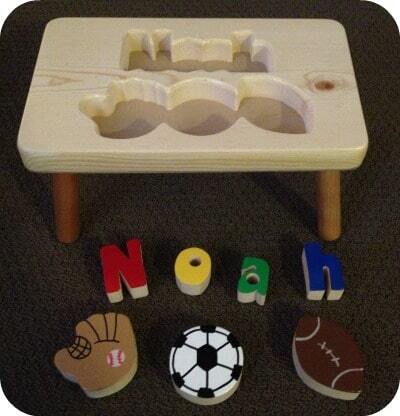 When I saw the Sports Design Puzzle Step Stool, I knew it was the perfect fit for my Noah! I chose the soccer design since both my boys are into kicking a soccer ball around every chance they get. 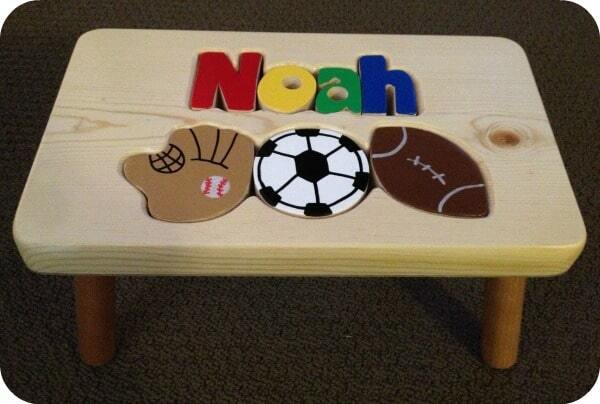 I figured it was a great item to have in the playroom and even though the name on it would be Noah’s, I knew that both boys could get use out of. When it arrived, I have to say that once again I was super impressed with the quality of this piece. It is a very sturdy piece that will withstand all the abuse my boys will throw at it. The stool is crafted of sturdy pine wood and non-toxic paint in primary colors, with smooth lacquer finish. The puzzle pieces are cute and my little guy really gets a kick out of the simpleness of it. At $69.99 this is a great investment piece that will be sure to delight any boy in your life – just read the reviews online for yourself! Personal Creations has been around for over 10 years offering the best selection of personalized gifts for every occasion. They offer gift wrapping and personalized messages so that you can ship your gift directly from their site to your recipient. There turn-around time is great and you can rush orders to get them out on time for the big party, Christmas or any other occasion that might sneak up on you! I trust Personal Creations for their quality, their selection, their prices and their customer service. You should too! Check out the Personal Creations website to see their complete line of gifts. While you’re there, check out their blog and sign up for their online newsletter and their catalogs. You can also find them on Facebook and Twitter. I love personalized gifts and the stool is very cute! Thanks for your review! That’s pretty cute. I wouldn’t mind having the one with two names! Cute item, I would love to get one for my son Rhett. This would be perfect for my boyfriends grandsons because they both could have one with their names on it and no fighting over who’s is who’s. I have 3 nephews, 2 of which can’t yet comfortably reach the bathroom sink. Something like this would be so much fun for them. I will look to Personal Creations for the next birthday gift. I like that it is personalized. My niece and nephews would love this. I love personalized gifts.. I’ve had places where I pay a lot for the personalization and that’s it because the quality is not worth the money.. Good to hear that their items are high quality pieces! I love that it’s personalized. Something like this would be perfect for my nephew. The stool is so cute, I love personalized gifts too. I have never been to Personal creations website, but can’t wait to go. Thanks for sharing. Really cute little stool, I love so many things at Personal Creations. Their Rag Dolls are so gorgeous and my little one just loves her one with her name on it.